Tim Hon and Steve Ha bring a self-taught style and old-school graffiti sensibility into plain view on Oakland's streets. Tim Hon and Steve Ha met at Newark Memorial High School and began tagging their names together around the East Bay. Tim Hon, wearing scuffed Converse All Stars, well-worn jeans, and a loose-fitting sweater, is smirking. Next to him is Steve Ha, who dons a down vest covered in paint and has a stern gaze that peers out from behind his glasses and beneath the brim of his camouflage cap. While they attempt to pose for a picture, Hon keeps spraying paint on Ha, who tells him to quit it. But Hon laughs and, as soon as they turn back toward the camera, sprays him again. This mischievous nature explains a lot about Hon and Ha, Bay Area natives who make up two thirds of the art collective The Illuminaries. (San Diego artist Romali Licudan is the third member). Neither have received any formal arts instruction, but that hasn't kept them from producing several large, in-your-face, public murals around the East Bay. Influenced by the first wave of graffiti styles and artists that migrated from cities like Chicago and New York in the 1980s, Hon and Ha embraced the counterculture and rebellion innate to graffiti, resulting in a bold style of painting as well as several run-ins with the law in their younger days. Ha and Hon met through a mutual friend at Newark Memorial High School in 1996, and quickly began tagging their names together around the East Bay. They cite hip-hop culture in the Bay Area in the '90s — what Ha refers to as "the golden era" — as an influence on their work. "We were like the second generation of writers on the West Coast," Hon explained. He listed several graf artists who were active at the time as inspirations, among them the legendary Oakland writer Mike "Dream" Francisco. "When graffiti first came out here from the East Coast, there was a place called Psycho City in San Francisco," Hon said. "It was like a museum for graffiti. People would come from all over the world to write there, and it just blew me away." Being self-taught and influenced by the hip-hop aesthetics of the West Coast, the duo exhibited a style that was, and remains to this day, wild and bold. The Illuminaries favor huge swaths of bright color, exaggerated proportions and perspectives, and fluid and intricate lettering. After high school, Hon and Ha spent their nights driving around in Hon's parents' minivan full of spray-paint and throwing up pieces. "We'd sneak out and roll it a block away, start it up, and just hit freeway spots all night," Hon said. This was between 1997 and 1999, when authorities were cracking down on activities such as graffiti and skateboarding. Given the heightened vigilance, Hon and Ha ended up on the wrong side of the law more than once. "We got caught two times, and both times we made the news," Ha said, adding with a wry smile. "My dad recorded it the first time." Things got more serious in 1999 when BART police, which had organized an anti-graffiti task force, raided Hon's house in Berkeley. The cops found enough paraphernalia, coupled with evidence gathered by the task force, to arrest the two and charge them with several felonies. Fortunately for the both of them, they were able to plea down to misdemeanors. The experience prompted Hon and Ha to put aside their spray cans in search of a safer way to make art. "We turned to graphic design," said Ha. In a fortuitous turn of events, their decision to stop tagging coincided with the dawn of digital design. They learned the basics of Photoshop and went off to start several small clothing companies and design album covers under the name The Illuminaries. Hon said the name came from a biblical passage about bringing light to the darkness. "It comes from when we were in a rap group," Ha said, prompting Hon to respond, "Why would you even mention that?" 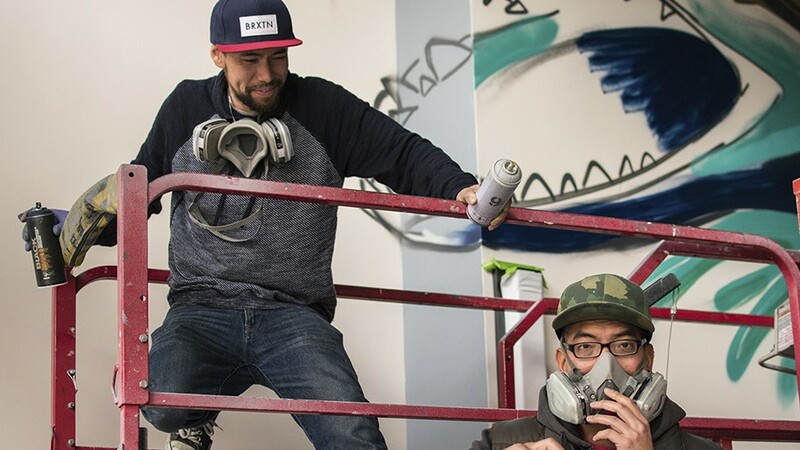 Ha continued to develop as a graphic designer and Hon worked as a programmer until 2007 when they reconvened to paint a mural at Diablo CrossFit in Pleasant Hill. "We did a lot of CrossFit gyms at first," Hon noted. The muralists began gaining notoriety in 2012 with the completion of a 49ers mural on 23rd and Mission streets in San Francisco. The mural — which depicts players Vernon Davis, Patrick Willis, and Frank Gore breaking through a banner that reads "Who's got it better than us?" — was originally painted as a backdrop for a music video, but quickly became renowned in its own right, culminating in several players from the 49ers showing up to pose for pictures in front of it. Since then, The Illuminaries have done a number of large murals for both the Oakland Athletics and Golden State Warriors, as well as for Visit Oakland, the nonprofit organization that promotes the city as a travel destination. Residents of the East Bay are probably familiar with "Rise & Grind," their ten-story mural of Stomper, mascot for the A's, on the corner of 19th and Webster streets. It reimagines the beloved pachyderm as a war elephant carrying all of Oakland on its back. After its completion, The Illuminaries invited more than 100 local graffiti artists to come and tag their names at the bottom. In all of their pieces there is a clear affection for the community they grew up in. Ben Taylor, destination development manager for Visit Oakland, noted the care they took on a mural project outside the Oakland Marriott. "I remember coming and seeing all the background details they had added in — "the BART tickets, the train tracks — it was phenomenal," he said.